Chiangmai Lodge offers valued accommodation both daily rental or long stay in a convenient location of Chiang Mai - Huay Kaew and Nimman. Book direct for best hotel deals in Chiang Mai. 1Hotelsolution.com Co., Ltd is specified as the websites creator. A profile of Chiangmailodge.net was found on the social network Facebook. The web server used by Chiangmailodge.net is located in Thailand and run by CS LOXINFO Public Company Limited.. 26 other websites are located on this web server. Most of them are provided in the english language. 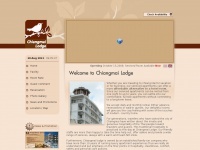 The websites of Chiangmailodge.net are hosted by a Nginx server and were developed in the programming language PHP. The HTML pages were created with the latest standard HTML 5. Both the inclusion of the website in search engines and follwoing of its hyperlinks is explicitly allowed.